Who is Nicolas Cage? Oscar-winning actor? Charming leading man? The king of rage? The answer of course is all of the above. His nearly four decade career has run the gamut. He's been acclaimed and panned. He's made hits and straight-to-DVD misses. But through it all, Cage is still making movies and we're still talking about him. Cage's latest is the strangest film of the year so far. Writer/Director Panos Cosmatos has an affinity for the grindhouse style of filmmaking. Mandy ... See More feels like it was teleported from the 70's and dropped into a projector for the midnight movie crowd. Cage stars as Red, a simple man who lives in the mountains with his wife Mandy (Andrea Riseborough), until a Satanic cult invades his home and sets him on a path of violent vengeance. 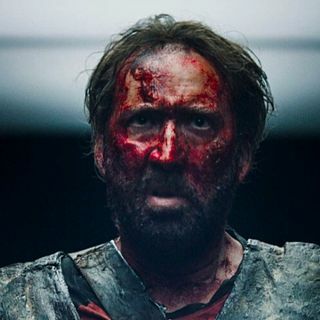 Mandy is a bizarre exploitation film that highlights the best and worst of Cage's career. Join Jon and Tim as they discuss Ozark vs. Breaking Bad, grindhouse movies, Nicolas Cage's filmography, why Mandy‘s aesthetic is groundbreaking, Jon's DC Talk reference, VOD Cage Rage, inappropriate laughter, a Birdman rant, financial advice for celebrities, the dog poop cookie analogy, why demons need motorcycles, and what makes a movie worth watching.